This tea farm grows Japanese shincha green tea: excellent soil, climate, quality. It’s run by Yamamototoyama, in business since 1690. But it’s a long way away from Kyoto, though: 18,000 kilometers. It’s near Sao Paolo, Brazil. Just as tea is emblematic of England and core to its history, coffee and Brazil go together as almost one word. And just as Britain is becoming a dynamic and vibrant coffee market, demand for tea is expanding in this nation of 200 million, whose borders touch every South American country except Chile and Ecuador. Tea drinking in Brazil is growing at twice the world average rate. The main reason is its appeal to people looking for a healthier lifestyle but also for its immense variety of flavors and styles. This looks like something new but in many ways it’s back to the future. Brazil was once a substantial grower of tea. Its language remains Portuguese, and the Empire of Brazil paralleled the American Revolution in an 1822 declaration of independence from the dominant tea trading power in European history―that was Portugal, not England. 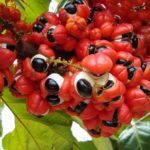 Brazil has a rich variety of national drinks, including chimarrao, cachaca, mate, guarana, quentao, and cajuina. And, of course, it is the largest and most famous producer of coffee, the $100 billion global drink. In modern times, the world’s other $100 billion beverage has not been part of everyday Brazilian life. This is tea. While 98% of households drink coffee, only a small fraction has even tried tea. Sixty cups of coffee are drunk for every one of tea. That’s changing. The main reason is its appeal to people looking for a healthier lifestyle but also for its immense variety of flavors and styles. There are so many other choices, too…. 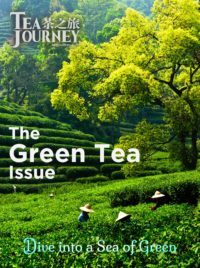 Herbal teas, an area where Brazil produces some world-renowned varieties (Brazilian mint tea was found in a major study to be more effective in curing fevers, headaches and flu than the drug indomethacin), iced tea, ready to drink canned and bottled tea, and even alcohol-based teas comparable to quentao. So, Brazilians are discovering tea. More accurately, they are rediscovering it. At one time, Brazil grew a large amount of black tea, beginning around 1810. The Japanese influence on Brazilian tea farming is pervasive. 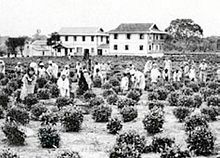 In the early 1900s, immigrants from Japan who settled in Registro, near Sao Paolo, brought with them tea seeds from Sri Lanka and India. These grow into bushes that are hardy and excellent for growing black tea. The early seeds had been from Chinese bushes. By the 1930s, the 1,500 Japanese Brazilian growers in the Ribeira Valley region were thriving. 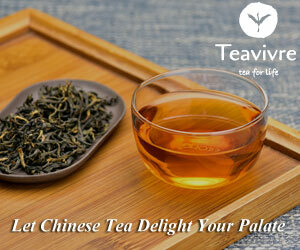 The climate was ideal for tea: subtropical, with the fertile acidic soil required to grow the best leaf. It was misty, providing the weather patterns tea requires. Registro had 50 processing plants handling 12,000 metric tons of black tea in 1987, most of it exported to Britain for blending in breakfast teas. That’s 5 billion cups of tea. But the overvaluation of the currency in the 1980s made exports too expensive and the subsequent financial collapse wiped the industry out. Today production is beginning to grow again but is still less than 500 metric tons. That adds up to 200 million cups – just one cup per year per Brazilian man, woman and child. The gardens were abandoned. The story of how they were rediscovered is a famous one and is we ll-known among tea lovers in Japan, the UK and U.S. Ume Shimada, a Brazilian of Japanese descent, was born into a tea-growing family. She decided to see if she could revive the dying plants in their own small 10-hectare garden, taking a full six months to complete the weeding. Other local families helped out, with one old hand restoring a broken-up antique leaf rolling machine. In 2014, she launched her Obaatian – “Grandma” – organic, hand-picked black tea. It’s been a distinct success especially in Japan, and Mrs. Shimada, now in her 90s, has been getting technical assistance and advice from industry experts as to how to improve quality and expand production. The lowland Brazilian “terroir”, the combination of soil, weather patterns and seasonality, gives Obaatian and other Brazilian black teas an attractive malty flavor and lack of bitterness. Most are low quality, but Oobatian is one example of a premium tea that is well-rated by UK and U.S. tea sellers. 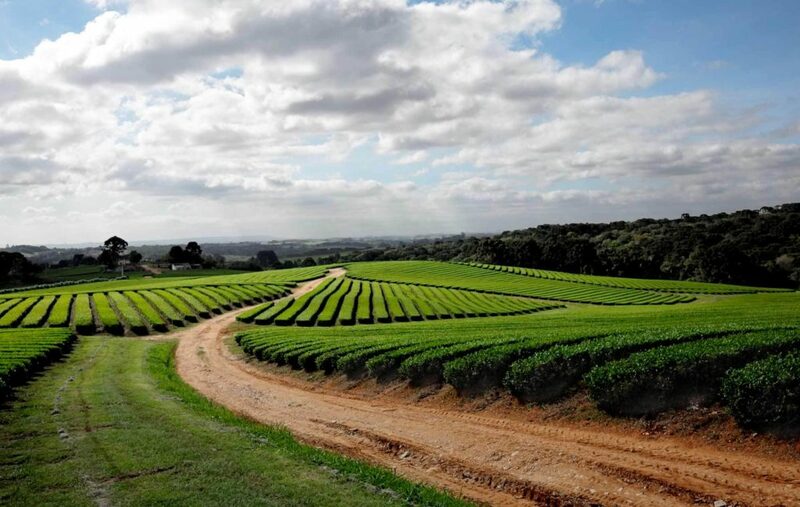 The Japanese company, Yamamotoyama, produces Japanese-style green teas in Brazil. Foreign giants are entering the market. 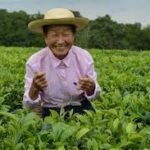 Lipton launched its tea bags in 2016 and recently acquired the Brazilian natural and organic food company, Mae Terra. It sees Brazil as a major future market for health food and beverages: Mae Terra has 120 products and has been growing at 30% a year. Or as its historical legacy being restored. 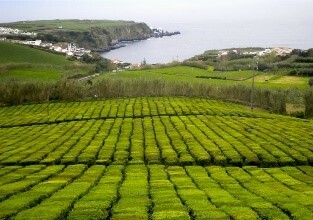 The origins of “English” tea are Portuguese. 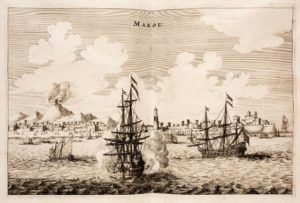 Portugal was the first nation in Europe to reach China by sea and set up a small trading post in Macao. As early as 1560, tea was a popular luxury among the aristocracy. The Dutch were the next to import it, starting nearly a century later. It wasn’t until 1660 that tea took off in England. And it was a Portuguese Princess, Catherine of Braganza who introduced it to the Royal Court there. She had been sent to make a diplomatic marriage with Charles II. She brought with her 60 loads of baggage – including her tea, of course. The world splits in two parts: those that use the word “cha” and the ones that call it “tea” or some variant in individual languages. Cha is the term the Portuguese adopted from the Chinese dialect of Canton, the area where they traded. The Dutch picked up “teh” from the pronunciation by their contacts in the port of Amoy. 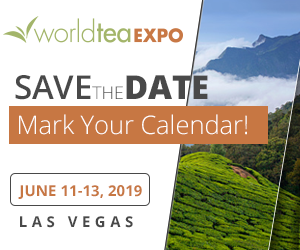 Very roughly, where tea spread from by land, it is cha – Persian, Russian, Arabic, Turkish, Japanese and Korean – and tea where the Dutch and English ships carried it to new markets: Germany, Spain, South Africa, Scandinavia, and India. Again, Portugal led and the Dutch and British followed. Portugal lost command of the seas and hence the spice trade to the Dutch in a war that lasted over 60 years, from 1602 to 1663. Portugal retained control of Brazil but lost the East Indies. Britain and Holland then fought two major wars with the British. The British eventually won and that was the start of English tea. 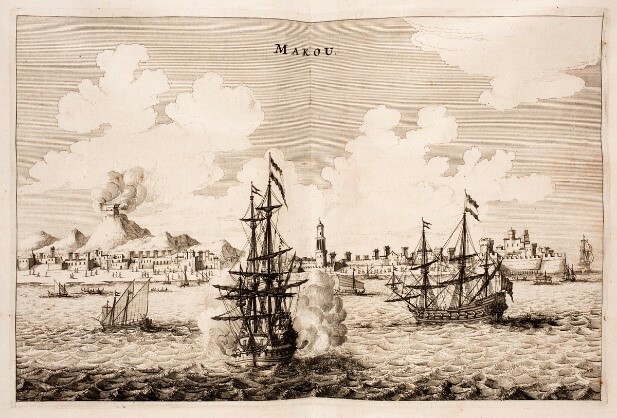 The picture shows the Battle of Macao, a three-day naval engagement in 1722, the only occasion when two European powers fought on the mainland of China. The Portuguese fleet came close to defeat but was able to repel the Dutch and maintain control of their key trading point. Now, jump forward in history to today. Portugal is the only country in Europe farming tea. Tea doesn’t grow on the mainland continent of Europe, except in a few small gardens in Italy and Scotland that are more for show than a serious business. 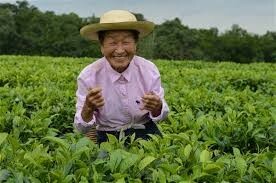 Tea has never grown in England, for instance. It is all imported, first from China, then India and Ceylon, and now around 30 countries in Asia and Africa. Today, the most famous brand of Earl Grey tea, Twining, is produced in Poland and the largest English firm, Lipton, has half of its tea bags made in Dubai, in the desert of the Middle East. But there is one place in Europe that makes tea – a very fine one. It’s part of Portugal, though way out in the ocean. This is Gorreana, in the Azores. These are a mid-Atlantic group of nine islands, with a temperate climate and rich volcanic soil. They are Portuguese territory, though a thousand miles from Lisbon. Tea was introduced in the early 19th century and production grew to fourteen factories. Gorreana (50 hectares, 120 acres) has made tea since 1883 and now produces 40 metric tons. Porto Formoso (5 acres) operated from the 1920s to 80s and was reopened in 2005. 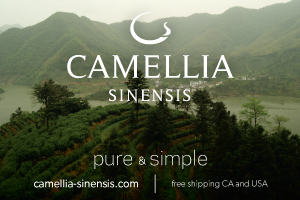 The climate is pristine, with no industry, pollution, pesticides or urbanization. The black pekoe and hyson green teas get favorable reviews as complex, slightly sweet and bold. The manufacturing process is very traditional; some of the machinery dates from the 1840s.